Arindrajit Dube enlarges on my post about efficiency wages, pointing out that the same logic applies to firms that have monopsony power. That’s a very good point — and I think we’re circling in on an important part of the logic behind the “new view” on inequality policy, which says that policies to enhance worker bargaining power can have major effects on the distribution of market income. What’s going on here? Maybe two schematic pictures can help. The employer’s choice of wage to pay is pinned firmly in place by the invisible hand. It can’t pay less than the going market wage, or it won’t be able to attract any workers; it really, really doesn’t want to pay more than the going wage, because any wage increase translates dollar for dollar into lost profits. Minimum wages or a strong union can force the wage up all the same, but it takes a lot of political or institutional power. 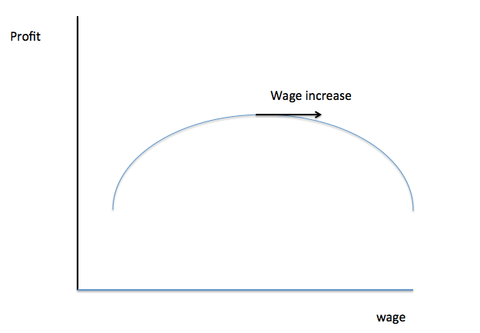 There isn’t a sharply defined “going wage”, either because the firm has monopsony power — it can, in effect, choose the going wage in its local labor market — or because efficiency wage considerations lead it to pay more than the minimum, so that there are normally more applicants than places. 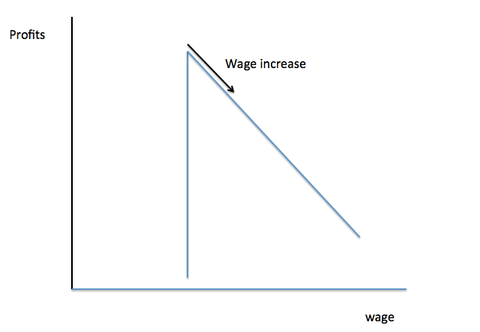 And as I’ve drawn it, the top of the hill relating the wage rate to profits is fairly flat. In particular, the firm shouldn’t mind very much paying a somewhat higher wage, because this will produce offsetting benefits — a larger supply of labor if it has monoposony power, lower turnover or higher productivity if efficiency wages are an issue, maybe all of the above. The point is that under these circumstances it needn’t be all that hard to push up wages: the threat of union organizing or a consumer boycott, even moral suasion from the government might be enough. So the standard view that it’s very hard to change the distribution of market income, that policy must involve after-market taxes and transfers, may be quite wrong. This entry was posted on June 12, 2015 at 7:15 am and is filed under Krugman's Blog. You can follow any responses to this entry through the RSS 2.0 feed. You can leave a response, or trackback from your own site.